M. menardi is widely but patchily distributed in Britain and apparently absent from large areas. 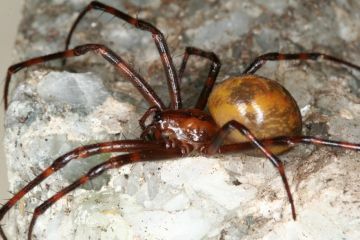 This spider is exclusively European (Platnick 1998) and is widespread in western and central Europe. This species lives exclusively in permanently dark, damp habitats such as caves (including sea caves), mines, sewers, ice-houses, damp cellars, limestone pavement, hollow trees and railway tunnels. Very occasionally it may be discovered beneath convex artefacts in fields (Felton 1995). Dry habitats are not occupied by this species. M. menardi produces a large orb web, but usually resides on the wall of its habitat. Prey items include hibernating Lepidoptera, mosquitoes, slugs, isopods, millipedes and beetles (Smithers 1996; Cropper 1997). Both sexes are mature throughout the year (Howes 1999). Large, white, tear-shaped egg-sacs are suspended from the roof of the spider's habitat between September and February, these persist for a long period even after spiderling emergence. Hatched spiderlings have been noted within egg-sacs in January. Local. It is probably under-recorded throughout its range due to its specific habitat preferences.